Updating to Keynote 9 & Pages 8? the transition forward to the new generation. 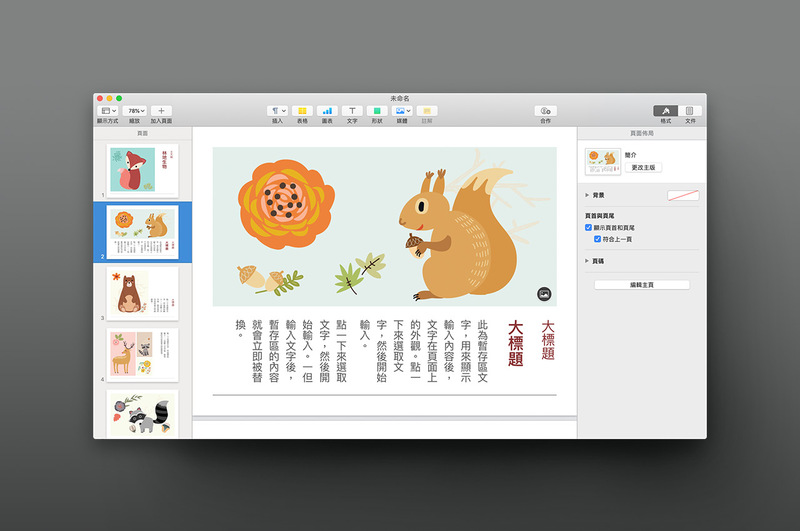 The latest generation of iWork is here: Keynote 9 and Pages 8 arrived on March 29th, further refining the latest generation of Apple's presentation and publishing apps and continuing the Second-Era evolution that began with the launch of Keynote 6 & Pages 5. Keynote and Pages for iOS are updated as well to version 5.0, adopting many of the same core features of the desktop updates and continuing to add increasing feature-parity with the desktop app. With the architectural reboot of the previous cycles now firmly in the rear-view mirror, Keynote 9 and Pages 8 continue to refine & expand on the features and capabilities of the cloud-centric architecture at the heart of their modern lineage. If you're already up-to-date with Keynote 8 or Pages 7, the upgrade to Keynote 9 & Pages 8 should feel very familiar, with no major changes to general workflow or the underlying theme / template architectures. All of our currently-shipping NXT-generation themes and templates should perform as expected in the new apps. Many of the biggest new features this cycle have come to both apps in parallel, adding increased conveniences via deeper iCloud integration, along with localization-specific features that make the entire iWork Suite more useful & accessible to a broader audience than ever before. If you've been installing our themes on the desktop & separately to your iOS device via DirectInstall, you'll likely have a number of duplicates once the initial sync is complete: fortunately, the apps now list which device a theme was initially installed on, making it easy to purge any duplicates via a simple removal. From there on, you'll only need to install a theme or template once on your preferred device to have it appear everywhere - and if you've been using the manual install process for Pages while we've been working on expanding DirectInstall to Pages templates, this will definitely save you a few steps getting your templates onto your iOS devices. Note that while we're referring to this as an ecosystem-wide update, it doesn't actually apply to the web-based Keynote or Pages apps on iCloud.com – you'll still need a Mac or iOS device to apply a custom or 3rd-party theme to a new presentation or document. But once that file is saved, it's business as usual in terms of sharing, editing, or playback via the web app. 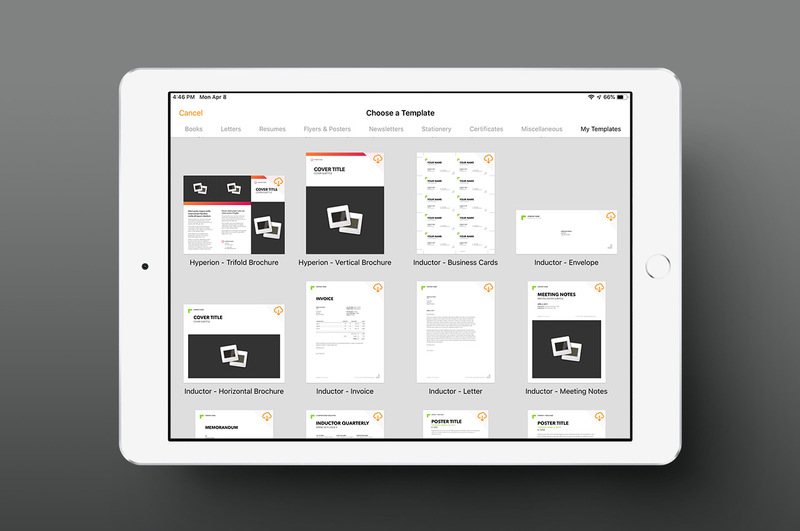 Similarly, Shape Sync uses the same functionality to sync up any Custom Shapes you define in your Keynote presentations or Pages documents to a shared library among your Mac and iOS devices. Once again, this doesn't extend to the web apps at this time – but it's supremely handy if you frequently use a set of common Custom Shapes in your presentations or documents. 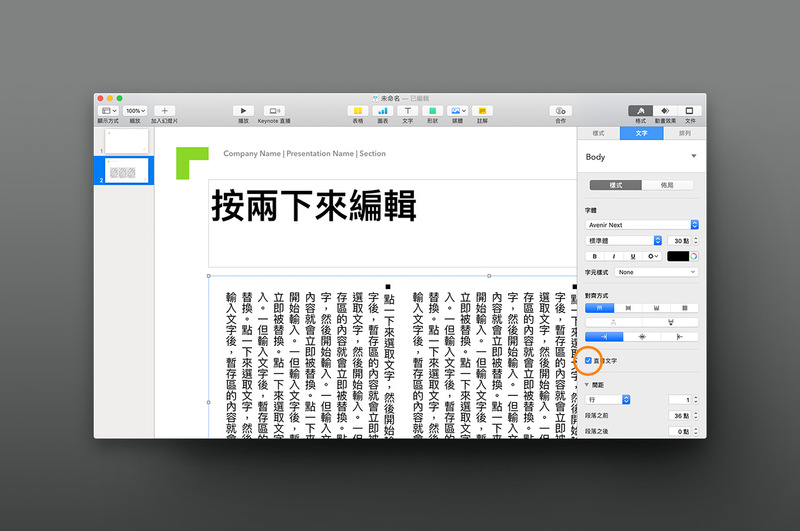 Vertical Text Support for Chinese, Japanese or Korean language Localizations is new to the 2019 apps, making the iWork apps far more useful to anyone wishing to use traditional vertical-text runs in their presentations or documents using those localizations. 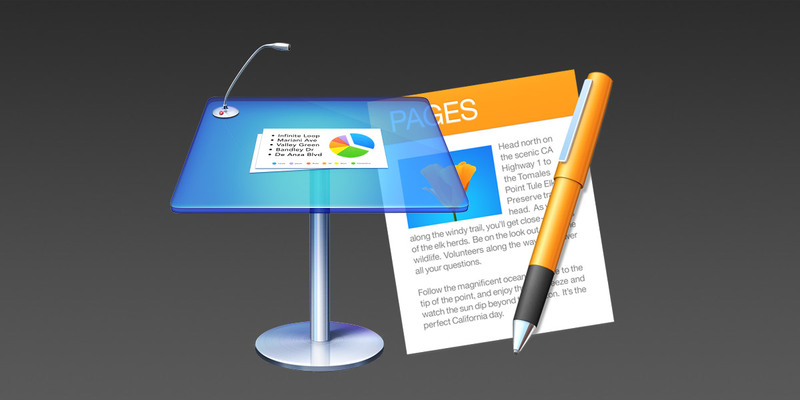 PowerPoint has used dedicated master slides to achieve this for years (hidden by default on Mac, unless one of those localizations is active), but Apple has taken a different approach in Keynote, Pages, & Numbers by extending the capability on a document-wide basis or on an object-by-object basis on text-box objects and shapes – meaning you can convert any layout or master to this format on-the-fly (provided the spatial arrangement is well suited). New Vertical-Text templates are included in Pages 8.x for Chinese, Japanese and Korean localizations. We're currently exploring ways we might enhance our themes and templates to better suit our customers using these localizations (and if this effects you, please let us know your thoughts) – we'll announce any move-forward changes here once we have a better idea of how it will impact our meta-architecture and production process. Simply toggle the Vertical Text setting as needed on existing slides/layouts. Traditional right-weighted Vertical Title & Text layouts will need to be addressed via masters (or re-arranging elements on the slide/page itself in the meanwhile) – curiously, Apple doesn't appear to have added new masters to the built-in Keynote themes that adopt this style regardless of which localization settings are applied. Beyond the broader Ecosystem-level changes, Keynote 9 has received a number of app-specific enhancements that further refine cloud-based collaboration, add new formats, and improve the authoring experience for an even broader range of presenters. Authors & presenters working on ultrawide decks have been heard: Improvements to Navigator, Light Table and Presenter Views have brought more accurate previews of your entire slide to each view. It's immediately apparent in Light Table view, particularly in 3:1 format – in Navigator view you may need to expand the slide previews from the default (cropped) scale to reveal the complete width, but it will no longer crop the preview prematurely before it begins to scale them up as you expand the view. 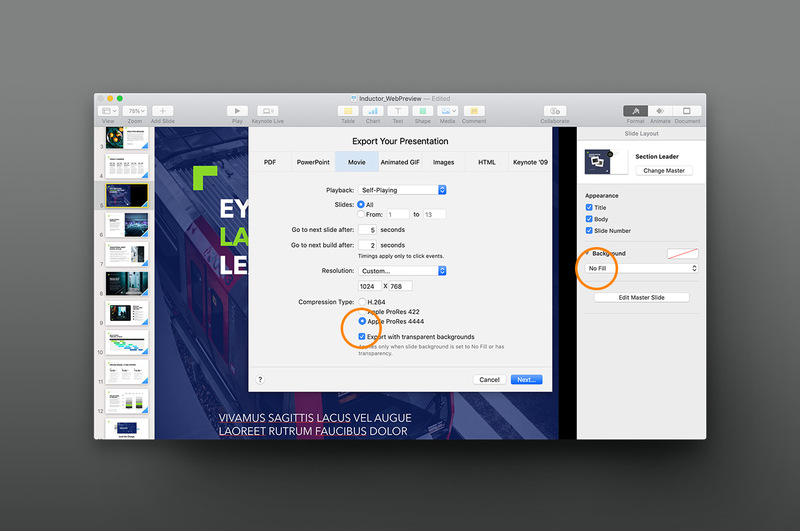 Animated GIF Export is new to Keynote 9, enabling you to export one or more slides as an Animated GIF file. While it's not a suitable format for most full-presentation export scenarios, it's a handy addition to the arsenal when it comes to creating shorter pieces for social media or pre-comps for other presentations / documents. We actually have a couple of new Add-On classes being worked on as labs that should be well-suited for this feature – more to come on that later this year. Select a Slide or Slides to Export to Animated GIF format. 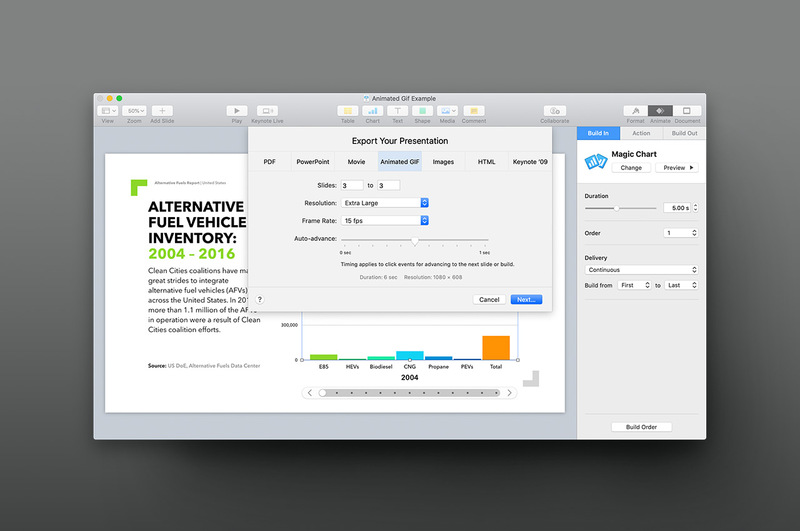 That's a Single-Slide Export - we're using the Magic Chart build on a simple Interactive Column chart with no additional tweaks, so Keynote's handling every bit of transforming what's usually a step-by-step slide to an animated snippet you can use on the web right away. Export Transparent GIFs or Movies using the "No Fill" Background setting. We'll need to do some additional testing to get a better sense of how well this works in a production setting, but it holds some real promise in terms of using Keynote as a pre-comp tool for Title Cards or Overlays. Pages has also received a few notable app-specific improvements this cycle, refining collaboration features and guides alongside a new View that makes it easier to navigate your documents. Beyond a few behind-the-scenes improvements to Page Master definitions, the most notable addition to the 8.x series is the new Table of Contents View, which allows you to navigate complex, tagged documents more easily. While we'd initially hoped this entailed a larger overhaul of the Auto-TOC functionality app-wide, it's primarily a navigation aid at this stage. You can add an Auto-TOC to Word-Processing mode documents using the v5 iOS app now, which has been a big request for a few versions running. But you can't, for instance, add an Auto-TOC to a Page Layout document – in a Page Layout document, building a TOC in the new TOC View will insert what are essentially Shortcuts to the styles you've tagged for inclusion. 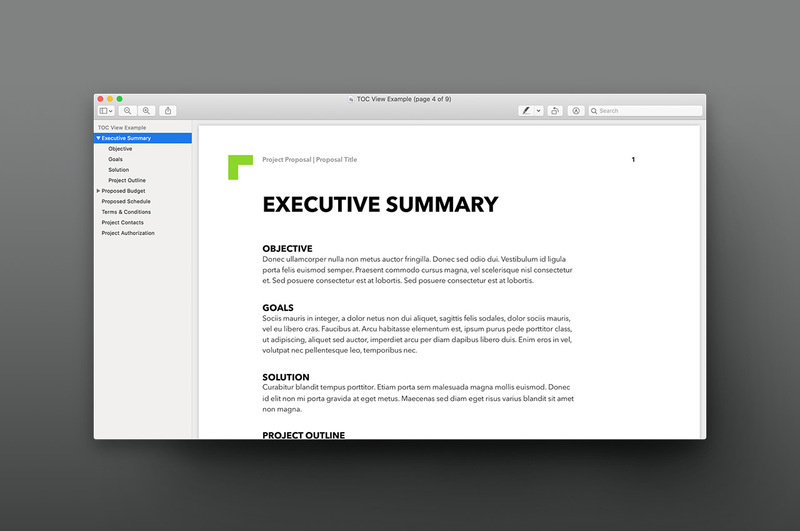 The new TOC View helps you quickly jump between sections of your document. We'll be shifting to both Keynote 9.x and Pages 8.x as our functional baseline for all new Themes & Templates moving forward. 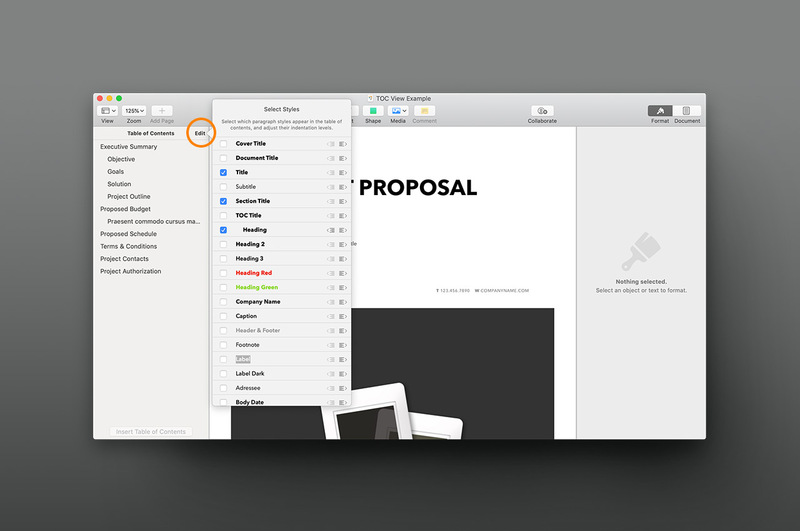 Presentations and Documents created in Keynote 7-9 and Pages 6-8 are largely cross-compatible, excepting elements associated with new features, so this shouldn't impact any of our customers that are current as of at least Keynote 7 / Pages 6. As noted during the Keynote 8/Pages 7 cycle, we've already migrated to Pages 7-style Page Master implementations on all of our Page Layout-mode templates, making Pages 7 our effective floor for newer template systems like Verge or Inductor. As always, consult the Compatibility Matrix at the top of each theme page if you're ever in doubt as to which version a theme or template is designed for. As noted, the new CJK Localization options in particular will likely have an impact on our long-term meta-architecture plans - we'll update this page with more information once we've clarified how the revisions will play out. We've also recently started to phase-out our remaining Keynote '09 Themes from the active library. The few remaining Keynote '09-optimized themes that haven't made the transition to NXT status have gone into retirement for a while (at least) - leaving the original NXT triad of OM, Sonoma and Tokyo as the only themes still offering backward compatibility for '09 at this time. As we deploy our upcoming website refresh, these last vestigies of Keynote '09 will, themselves, move to the background as Archival-only downloads – finally closing the door on iWork '09 some ten years later.